Some of the finest hiking opportunities in west-central British Columbia can be found in the area within the Skeena Mountains ecosection of Babine Mountains Provincial Park. The vegetation of the Babines includes sub-boreal spruce and alpine tundra. In the lower timbered areas are white spruce, subalpine fir, lodgepole pine, trembling aspen, black huckleberry, bunchberry and feather mosses. Area habitat supports healthy populations of mountain goat, moose, marmot and many species of birds. One small area on the northern slopes of Mt. Cronin has been proposed as an Ecological Reserve to conserve the most northern known example of the Whitebark Pine. Flowers, trees and shrubs are part of the park's natural heritage: please don't damage or remove them. The Joe L’Orsa Cabin is available to the public year round. It is located in the Silver King Basin of the Babine Mountains and is accessible via the Silver King Trail. The cabin which can accommodate 15-20 people comfortably, is heated by a wood stove and firewood is provided. There is a galvanized steel counter for visitors to operate their camp stoves on and a pit toilet located outside the cabin. 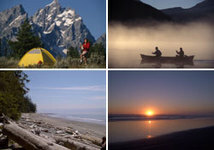 A backcountry fee of $5.00 per person is charged per night. It can be paid in advance to BC Parks in Smithers or deposited into a fee vault box located at the cabin. The cabin is subject to the first-come, first server rule. Be prepared to camp overnight if the cabin is full. Apart from this cabin, there are only wilderness/walk-in campsites available at this park and all are on a first-come, first-serve basis; reservations are not accepted. No facilities are provided (no toilets, drinking water, sani-station or showers). Most commonly observed in the area are mountain goats which make the area their year-round home, moose, black bear, ground squirrels, marmots and deer. Occasionally grizzly bear, lynx and wolverine have been observed. Park users should never feed or approach bears or other wildlife. Starting from the parking area north of Driftwood Canyon Provincial Park, the trail follows an old mining road and climbs gradually through the heavily forested valley. Sunny Point is reached at 6.5 km, and at 12 km skiers reach the sub-alpine and views of the surrounding peaks: Beware of avalanche hazard from 11 km to near the Joe L’Orsa Cabin at approximately 13.5 km. Exercise caution! A popular trail for ski tourers and snowshoers is the Lyon Creek Trail, which leaves the Driftwood Road about 2 km beyond the winter parking lot. By coming back down the Harvey Mountain Trail, the trail can be toured as a loop. From the trailhead at 34 km on the Babine Lake Road, follow the Cronin mine road 9 km to the old mining camp at 1100 m elevation. Another 4 km brings you to Hyland Pass at the top end of the basin. A wide variety of ski terrain exists in the Cronin Creek Basin, ranging from easy to difficult. Parties attempting more difficult terrain should be experienced with avalanche hazards. BC Parks, in consultation with various user groups, has designated certain areas for snowmobiling. Please respect these boundaries. Skiers and snowshoers may travel in the designated snowmobile area if they wish. Rugged terrain in some areas may produce zones of high avalanche hazard. Familiarize yourself with such hazards and have at least one member of your party who has experience in evaluating avalanche hazards. Be aware of wood ticks that are most prevalent between March and June. These parasites live in tall grass and low shrubs, and seek out warm-blooded hosts. As potential carriers of disease – particularly Lyme Disease – they should be avoided. Protect your legs by wearing gaiters, or pants tucked into socks and you good quality insect repellent. Thoroughly examine yourself, children and pets after any outdoor activities. If you find a tick embedded in your skin, remove it by gently grasping and pulling it straight up and out with a small pair of tweezers. Disinfect the site with rubbing alcohol. Save the tick in a small plastic or glass container for later inspection by your doctor especially if a fever develops, or the area around the bite appears to be infected. Access to the west end of the park is along the Old Babine Lake Road, which leaves Highway 16, just 3 km east of Smithers. Follow the signs to Driftwood Canyon Provincial Park. The parking lot and information map are located 5 km north of Driftwood Canyon. From there, the road is not passable to vehicle traffic. The closest communities, towns and cities are Smithers and Telkwa. To access the east end of the park, turn left onto Babine Lake Road, 6 km east of Smithers on Highway 16. The highway turnoff is at 0 km of what becomes the Burnt Cabin Road and then the Babine Lake Road. The Little Joe and Cronin Creek trailheads are found at 32 km and 34.5 km respectively along the route.